FORT GREENE – The Brooklyn Academy of Music (BAM) revealed last week its plans for a group of expanded arts spaces on Fulton Street. Scheduled to debut in October 2019, BAM Strong will unite BAM venues along Fulton Street and enable growth, building improvements, and greater accessibility. The BAM Strong expansion includes the creation of the Rudin Family Gallery and the Robert W. Wilson Sculpture Terrace as well as a new elevator to the balcony level of the BAM Harvey Theater (651 Fulton Street). BAM Strong’s Rudin Family Gallery will be the organization’s first exhibition space dedicated to visual art. The 1,100-square-foot gallery will be located in a new one-story structure currently being built on the vacant lot at 623 Fulton Street, between the Harvey Theater and the residential building 230 Ashland Place. Situated on top of the gallery will be the Robert W. Wilson Sculpture Terrace where public art installations will be exhibited. Larry Ossei-Mensah will serve as Guest Curator for the Rudin Family Gallery. Ossei-Mensah was recently appointed Senior Curator of the Museum of Contemporary Art Detroit, according to ArtNews. The Rudin Family Gallery will connect to the Harvey Theater which closed earlier this year for the renovations. 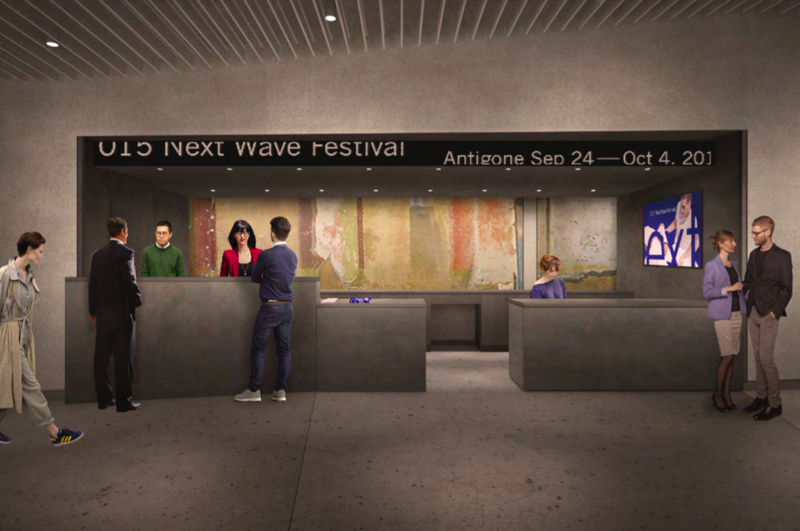 The theater’s lobby will feature a redesigned, user-friendly box office area providing an open space with service kiosks. Along with a new, wider staircase, the first elevator for the 115-year-old venue will be installed, providing access to the balcony. The second level of the Harvey will feature a new patron lounge that will overlook Fulton Street from a floor-to-ceiling semi-circular window. Built in 1904, the former Majestic Theater was renamed in 1999 to honor BAM’s former President and Executive Producer Harvey Lichtenstein who oversaw extensive renovations to the theater in 1987. All of BAM’s Fulton Street sites—the Harvey Theater, the Rubin Family Gallery, and 230 Ashland Place—will be connected by a “modern marquee” or illuminated canopy. BAM purchased the ground level of 230 Ashland Place (at the corner of Fulton Street) in 2010. Programming and potential uses for the ground-floor space have not been revealed yet. BAM Strong will be unveiled as the 2019 Next Wave Festival kicks off—the first season curated by BAM’s new Artistic Director David Binder.